Today, Amazon announced the Amazon Cloud Drive and Amazon Cloud Player for Web. This game-changing move will likely bring a boost to the decades-old online file storage services. 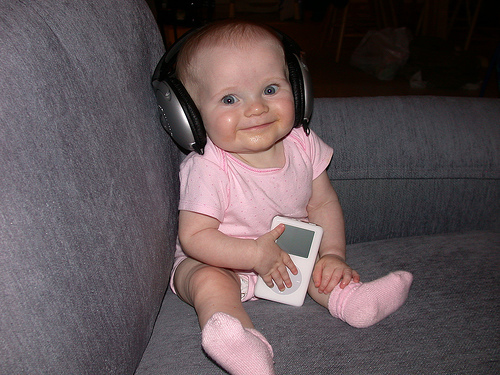 It may even have the effect of reining in music listeners who may have strayed, since the player will evidently only support purchased songs. We took a quick look into the MetaFacts Technology User Profile research and discovered several challenges ahead for Amazon and others planning to follow suit, as well as some elements that show Amazon is in the right place at the right time with the right offering. First of all, more Amazon shoppers alread use online cloud storage than non-shoppers. This means these consumers may be predisposed to cloud-based storage which is an advantage for Amazon. However, if the consumers currently using cloud storage are focused more on file backup and file/folder synchronization services, these don’t appear to be in Amazon’s initial offering. In fact, Amazon’s shoppers are already active music-listeners, being well above average in music downloading and listening to streaming audio. They are also more active using social networks, as well as sharing photos and videos through networks like Facebook, or through sites like HP Snapfish. Meanwhile, among users of cloud storage services, Apple’s footprint is substantially higher than among non-cloud users. Further, users of cloud storage skew younger than Amazon’s current clientele. This could have the effect of drawing in younger customers to Amazon’s customer base, or may be ignored by Amazon’s relatively older and less cloud-savvy customers. Cloud storage users have a higher share of Smartphone use than non-users, with higher shares for use of RIM Blackberry, Windows Phone, Apple iPhones and Android Smartphones. Because most consumers may not know that Amazon has supported back-end cloud storage for many other technology firms, consumers are likely to raise concerns about Amazon’s experience and security capabilities. Interested tech marketers and researchers may contact MetaFacts for licensing information. The results in this TUPdate are drawn from the MetaFacts Technology User Profile Survey. Results specific to this topic can be obtained through customized report. Also, you may obtain the related MetaFacts Technology User Profile Overview Edition Report, which covers the broader range of key trends, by contacting MetaFacts. View findings in 25 pages of executive summary analysis, 200+ pages of charts and graphs, all supported by 95+ pages of detailed tables. The complete, 300+ page report is delivered to you electronically. This edition is for the U.S. based on the 2010 wave of Technology User Profile gathered among a scrupulously selected set of representative respondents, surveyed both online and offline. 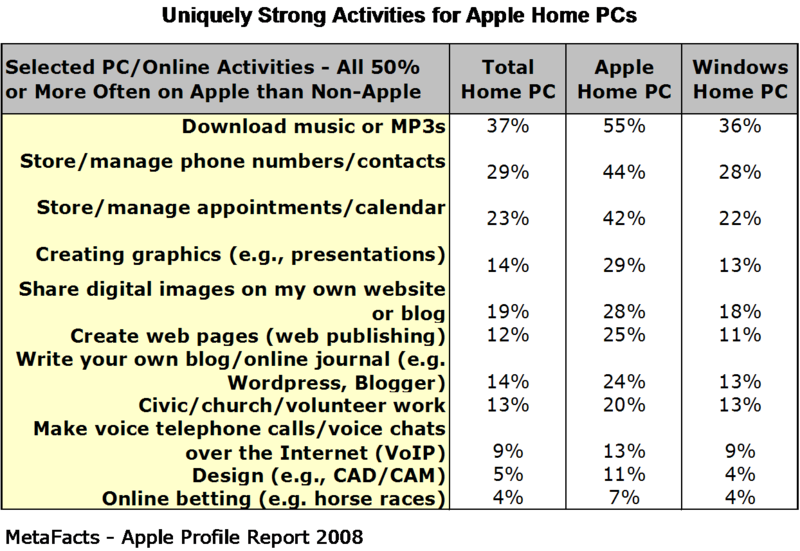 Apple Home PC users are simply more active than Windows Home PC users. They use their computers for a wider range of activities – 21.1 – than Windows Home PC users – at 17.5 activities. Also, Apple Home PCs are used differently than Windows Home PCs. Apples are more often used for graphics & imaging, personal, and communication activities, with more than 25% more activities in each category. Apple users simply find a wider range of uses for their computers than Windows users. When it comes to the everyday activities for a Home PC, there is little difference between Apple and Windows PCs. The top 10 activities on Apples are the same as the top 10 for Windows PCs, although the order is slightly different. There are 11 activities which stand out as uniquely Apple, reaching a much higher proportion of its base. Some of these activities are not widespread, so might be leading-edge if they gain popularity among Windows users, or may simply reflect Apple’s unique users. For example, creating web pages is a function of Apple’s software as well as its audience. One-fourth (25%) of Apple Home PCs are used to create web pages, compared with one in nine (11%) Windows Home PCs. Apple simply makes it easy and smooth to create well-accepted web sites, both with bundled software such as iLife, as well as commercially available software and a tightly supportive ecosystem. Also, Apple users are more often in the creative class, with occupations and interests that are more outer-directed and proactive than typical Windows users. There is not a large difference in the number of hours that Apple users use their Home PCs than Windows Home PCs. On average, Apple Home PCs are used 18.1 hours per week, slightly less than the 18.5 hour average for Windows Home PCs. Even for the 3rd Home PC, the usage pattern is similar: with Apples being used 10.9 hours per week compared with Windows Home PCs at 9.9 hours per week. Apple Home PC households have a slightly less utilitarian outlook than non-Apple households. Two-thirds (67%) of Apple households say they find their computer more useful than a year ago. A slightly higher share – 71% – of non-Apple households says the same.